Joanne Sher: Editor/Proofreader : "Let Me Pray For You" - A Giveaway!! "Let Me Pray For You" - A Giveaway!! Delivered is a special book, by a very special group of authors, most of whom are, or were at some time, regulars at FaithWriters. It is a collaboration of 25 different authors from all over the world, and I can honestly say that every chapter is a blessing. 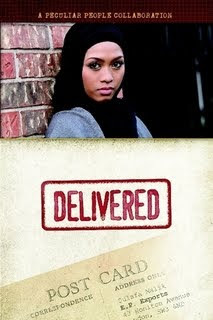 The premise of the book, in a nutshell, is that a Muslim woman in England, recently converted to Christianity, reaches out to America by sending out postcards with a simple phrase on them: "let me pray for you." The story of this woman, and the folks who received the postcards, is quite an inspirational one. And believe me - there's a lot more to the story than this (but you don't want me to give it away, do you?). You are more than welcome (and encouraged!) to purchase this book through the Peculiar People (the organization that put the project together) website. But, I'm ALSO doing a giveaway here of one of my copies (signed on my particular story, if you'd like). This contest opens RIGHT NOW, and will close at 6am ET Saturday morning. All you have to do to enter is comment on this post WITH SOME SORT OF PRAYER REQUEST (Yanno? The whole "Let Me Pray For You" thing?). If I don't have a way of contacting you, please leave me your email address. The winner will be posted some time on Saturday. But WAIT - that's not all! You will actually have TWO chances to enter. On Friday, I will post a short excerpt from my chapter of Delivered on my blog, as part of the incredible and wonderful meme Friday Fiction.You can ALSO enter by leaving a comment on that post when it's up. SO - one prayer on this post, and one comment on Friday's post for your chance to receive a super book. Sound good? (Oh - and, of course, I WILL lift up your requests to the Father. That's the bonus, right! Don't forget to enter your request for a chance to win! Have a blessed day! I've been looking for a job for a few months now and the more I interview/apply, etc., and don't get any reply or am rejected, the more I'm starting to lose a little bit of confidence. I just came off a 13 year job that I had to give up because I was relocating. Hardest thing I had to do recently. I miss my job and my friends. So, I guess just pray for confidence, guidance from God and peace. Thanks. Book sounds great. Dear Heavenly Father, I lift up Stephanie to You. Calm her nerves, Father, and give the doctors and everyone else involved wisdom and Your discernment. May the procedure go well, with no complications. I pray for her husband and daughter as well, Lord - help them to be supportive, and to deal with whatever time they will be without Stephanie. I also lift up Ruth. You have put this desire to teach in her, Lord. Substituting can be so frustrating and discouraging, Lord. I know You have the perfect job for her, Lord, where she can use herr God-given talents to help children learn. Bring that job to her, Lord, and close any doors You do not want her to enter. And Lord, be with Mama Mote (sorry - I don't know her "real name") as she continues with her job search. Help her to put all of her trust in Your timing, and Your provision. Do not allow these missed jobs to discourage her. Help her to remember that You are in control of all of this, and that your plans for her are much higher and better for her than any of these she has "missed." And, Lord, help her to lean on You for her friendships, and to understand that no one loves her as You do. Jeff and I are in need financially too, but most importantly is his health and some deeper issues I'm not able to publicize. To make it through the semester without literally losing myself or my family. Thanks, JJ. What a great idea! I'd love prayer for my husband with some conflicts he is trying to resolve in a leadership position, as well as prayer for my son to hunger for the things of the Lord. Thank you, and congrats on the book! Heavenly Father, You know exactly what struggles Karlene and her husband are having. I pray that you would meet their needs in an obvious way, so no one would question that the answer came directly from You. I pray for her husband's health, and for You to provide the finances they need. And Lord, I lift up the dear, sweet Sawa to you. I remember the stresses of college, Lord - but You know them even better. Give her the wisdom she needs to juggle all she must get done, from classwork to CLEP to her family to all her writing. Be with her, Lord, and help her to lean on You and to depend on You for everything she wants and needs. Father, be with my dear friend Laura, who, given the option, asks for prayer for others rather than herself. Meet all her needs in a special way, and help her continue to have her outward attitude. That said, I lift up her husband Brian to you. Give him wisdom to handle the conflicts that are before him, and give him confidence to do what needs to be done. Be with every person in the organization, and help them to see Your way as best. I pray also for her son - that he would seek You with the hunger only You can give him. Help him to see you as the answer to all his questions, and the goal of all his desires. Thanks Joanne! I hope it's okay to post a private request. Family related. Faith testing issue. Major international move coming up in ten days. The moving company is scheduled to come next week to pack up my stuff, but the scariest thing is the future of my beloved Abby and Lou Lou Belle. I know, who prays for cats? But I can't stand the thought that my final act here in Venezuela might be to take them to the vet and have them put down because I can't find a home for them. I'm trying to get the paperwork done to take Abby with me but don't know if there is enough time. I have a temporary option for Lou, and will throw myself on a friend's mercy to bring her out later. God's will to be done and my peace of heart in carrying it out. Heavenly Father, I lift up Stephanie. Her life, I'm sure, feels so hectic with all that's going on. I pray for the leukemia treatments her son Casey is going through. Be with Casey through every step, and give the doctors wisdom. Be with Stephanie, too, Lord, both as the mama to this dear boy, and for her own upcoming surgery. Be with the surgeon, and give him Your hands to take care what needs to be dealt with. And be with little Ryan, Lord. Help him to feel like a part of the family, and not pushed to the sidelines. Let him feel Stephanie's love - and Yours. And Lord, I lift up Sharon and her family to you. You know exactly what her needs are, Father. Please meet them in a way that could only be You, and help Sharon to hold onto her faith so that when it is all resolved, she can give You all the praise. And Father, I lift up my dear friend Lynda to You as well. I know she is in a huge time of transition. Help her to get through this stronger and more faithful to and trusting of You. I pray for Lou Lou Belle and Abby, Lord. Bring the right person or people along to take the cats, or find some other solution. Expedite whatever paperwork needs to be done so that, if it is Your will, Lynda can take Lou with her. Give her peace in all that happens over the next couple weeks, and help her rest in Your perfect will. I need prayer for my youngest daughter and her husband. They are having big problems in their marriage. They have three beautiful children aged 8, 5 and 2. It breaks my heart to see how bad things are. Heavenly Father, I lift up my dear friend Dixie's daughter, and the precious life that is within her. I am sure this is a scary time for her, mixed with joy and anticipation. Ease her fears, and the fears of Dixie as well. Be with that precious baby, and I pray against complications and difficulties with this pregnancy. Help Dixie and her daughter to lean on You, Father, for all their needs. And Lord, I know how much it pains You when marriages break. I pray for Lynne's daughter and son-in-law. Heal their marriage, Lord. Give Lynne the words to say to help in that process, Father. And hold the children close to You. It is so hard for children to watch their parents fight, Lord - give them an extra measure of grace and comfort and peace. Do Your will in this situation, Lord, and help all to turn to You for guidance. Joanne, you are so sweet to do this! I orginally was part of this project but had to pull out due to time constraints. My prayer need is I finally have a second interview for a job on Friday that I would really like but more importantly we need! Thank you! Heavenly Father, You know of Terri's financial needs, and of this second interview coming up tomorrow. I pray that, if it is Your will, You would work in the hearts of the interviewers even now, preparing them to accept and hire Terri. If it is not Your will, Lord, give Terri peace and the ability to find the job You want her to have. Thank You, Lord, for meeting her needs now, and in the future. The premise of this book has captured my attention... glad you wrote more about it. Prayers for my "releasing" of some bitterness I've been harboring. I'm almost there, but not quite. Joanne, you are so awesome. Please pray for my husband who is having a problem with tinnitus. He has suffered with the constant ring in his ear for the past couple of years. Also, I am having a break out of psoriasis for over a year now. I have never had it before, and nothing seems to help. It is spreading over my whole body. Dear Lord, I pray for Elaine today. You know, Father, how much she longs to walk with You in every aspect of her life: to live out the life You have given her. Help her to accept Your plan for all things, and specifically to let go of the bitterness she is still harboring in her heart. I praise You for the progress You have already made in her heart. I pray she can completely let it go. And Father, be with Rita today. Give her relief from her psoriasis, if it is Your will. Help her to endure it as long as You would will her to, and give her relief from the discomfort. I pray that she would not grow weary of this condition, and that she would remember Your promise to never leave her or forsake her. I pray also for her husband and the ringing in his ears. Relieve it, Lord, and give them answers to why this tinnitus has come upon him. Give the doctors wisdom and him peace about whatever is done. Thank You, Lord, for hearing me once again, and thank You for this opportunity to lift my friends up to You. I'm so excited about this book being out!! Some of my good friends are in it!! YaY!! Praying for you, too, sweetie!! Heavenly Father, You know how much I love Patty, and am supporting her in her writing endeavor - yet, I know you feel infinitely more strongly about her. Give her the inspiration that only comes from You, Lord. Plant this story in her heart, and let it flow out onto the page/computer screen just as You would have it. Help her to release her anxieties and frustrations that are holding the words back, and write exactly as You would want.